Only a handful of nursing schools utilize cadavers for their students’ learning. While the College of Nursing employs advanced simulation technologies, such as high-fidelity mannequins, virtual or screen-based patients, as well as clinical experience with real patients, cadaver-based learning experiences are not yet part of the curriculum. Pruitt worked with three other medical students and Daniel Topping, the Anatomy Lab’s director, to design a workshop curriculum that allowed nurses to see and touch core parts of the anatomy and common pathologies and review common clinical scenarios like hernias and lung damage while peering into the human body. The nurses also flushed central lines, inserted tracheal tubes and used manual resuscitators to inflate balloons as simulated lungs with medical devices donated by the Osceola Regional Medical Center. 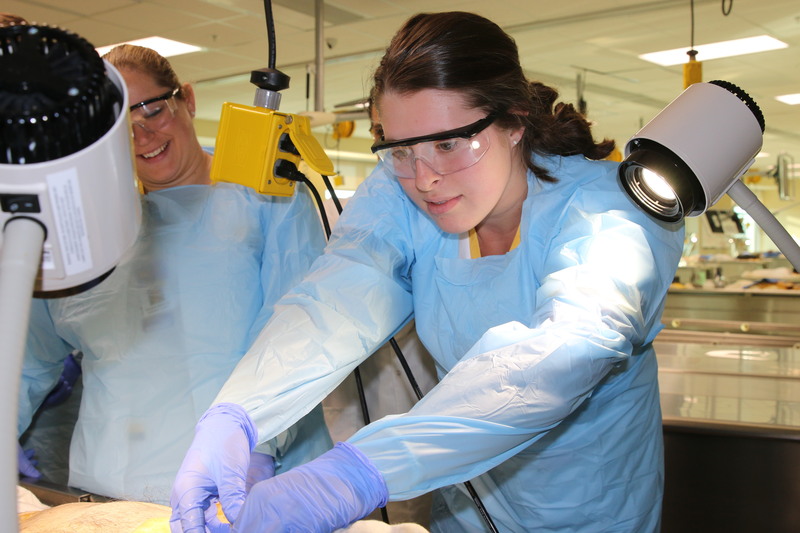 With the development of UCF’s new Academic Health Science Center, which will ultimately bring many UCF health programs to Lake Nona and encourage more interprofessional education, research and patient care, Topping says the Anatomy Lab workshop can be a model for future collaborations between healthcare disciplines. “Anatomy is fundamental to any discipline involved in direct care of patients, whether nursing, speech therapy, or pharmacology. And we have such a wonderful facility and resources here, which makes perfect sense for us to collaborate and begin partnerships,” he says.